The Tongariro Alpine Crossing passes over a volcano through an alpine environment. Approximately a third of the track is 1600m above sea level. The high point of the track is 1886m. Weather conditions can change fast. The forecast can be wrong. Which means you need to prepare for the worst and pack the right gear. Yes, you do need to take a rain jacket on a sunny day. Why? It’s simple. The forecast can be wrong, and the weather can change quickly from good to bad. The rain jacket must be good quality and fully water proof. It should be capable of keeping you dry for 6 hours in constant rain. Poncho’s are not suitable as rain will get in if the wind is blowing. Some soft shells are sold as being water proof. Most are not. The best water proof soft shells will keep you dry for a short time only. 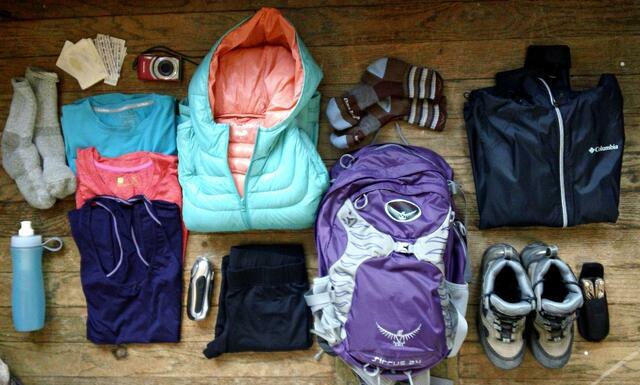 Packing extra warm layers is also essential, even on a fine day. Once again, it's because the forecast can be wrong and the weather can change quickly from a hot to cold. It’s pays to be prepared. Merino layers are good and keep you warm even when damp. Cotton won’t. Note: The temperature can be a lot cooler at Red Crater (highest point on the Crossing) than where ever you started off from in the morning. This is because air temperature decreases with altitude. Red Crater is almost a kilometre higher than Whakapapa and National Park Villages. And over 1.5km higher than Taupo or Turangi. Stronger wind at higher altitudes can also make if feel cooler. A warm hat to keep your head warm can be a life saver in cold conditions. You should always take a warm hat. It's nice to have a warm head. Sturdy foot wear is a must. You are going into the mountains on this hike. Some of the terrain is rugged. Good footwear will support your ankles and give you better stability. And keep your feet warm and dry. For experienced off-road running/walking people running shoes or light weight hiking shoes can be acceptable. There're no cafe's on the Tongariro Alpine Crossing. And no drinkable water. You will need to take enough food and water to keep you going for 8 hours. Starchy carbohydrates, protein rich foods, fruit & nuts are ideal energy sources. Tip: Drink more than usual the day before, and in the morning before the Crossing. If you’re well hydrated before you start you’ll need less water during the hike. 1.5 litres is enough for most people. A big breakfast before you set off is a good idea for extra energy. New Zealand sun can be brutal. Burn time for fair skinned people can be as little as 5 minutes during summer months. Once the sun is up there is no shade on the Crossing, apart from the last few kilometres through the forest. Sun glasses, sun hat and sun screen are essential even for a bad forecast, just in case. Remember, the forecast can be wrong. You should also take a map. It’s always nice to know where you are and where you need to go. The weather on the Crossing can change fast and the forecast can be wrong. 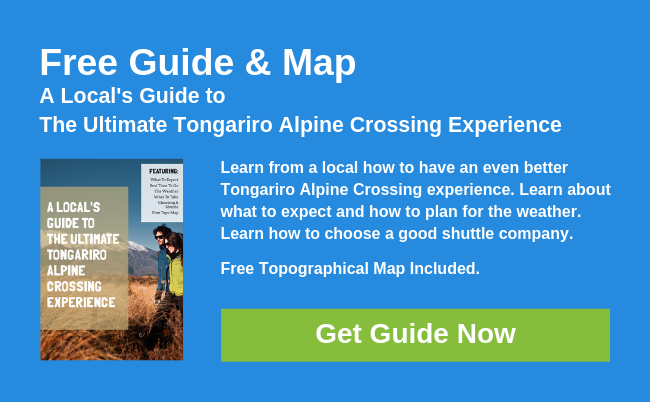 Take everything on the essential Tongariro Alpine Crossing gear list and you’ll be prepared for what ever the weather does. Being prepared can be the difference between an invigorating adventure or a survival test.